Home | Press Centre | Speeches | Christina Paxson, President of Brown University, introduces His Highness the Aga Khan at the 88th Stephen A. Ogden Jr Memorial Lecture on International Affairs. Brown President Christine Paxson speaking at the 88th Ogden Memorial Lecture in International Affairs at Brown University. Christina Paxson, President of Brown University, introduces His Highness the Aga Khan at the 88th Stephen A. Ogden Jr Memorial Lecture on International Affairs. Good afternoon. 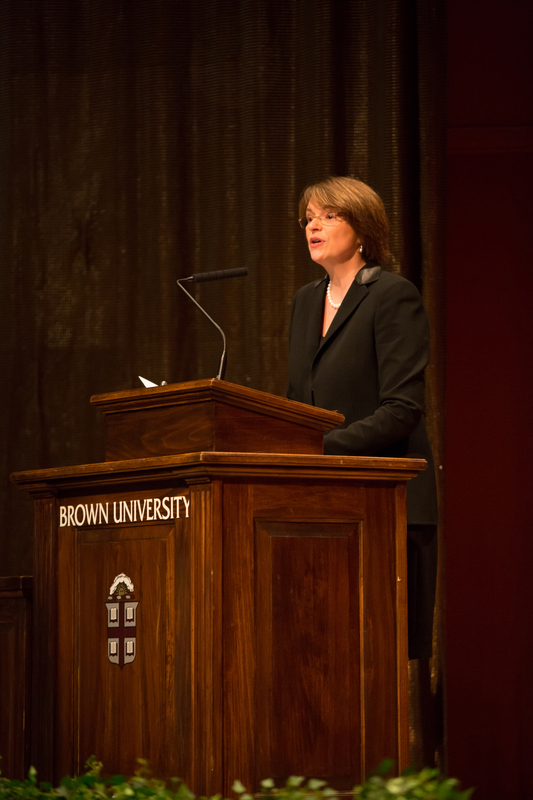 I am Christina Paxson, and it is my great pleasure to welcome you to Brown University for the 88th Stephen A. Ogden Jr Memorial Lecture on International Affairs. On Friday and Saturday last weekend, Brown launched its celebration of the University’s semiquincentenary — the 250th anniversary of Brown’s founding. This is a celebration that will continue for the next fifteen months, will figure prominently in two Brown Commencements, and will reach Brown’s extended family across the United States and from Europe to Hong Kong to Peru, and other countries as well. The international calibre of our celebration would have delighted Stephen Ogden, because it points, to Brown’s steadily increasing global engagement. Stephen, a member of the Brown Class of 1960, was what we would recognise today as an international relations concentrator. He sought to understand the causes of friction between nations and ideologies as well as the elements of international affairs that unite nations and peoples in the work of peace, prosperity and human progress. More than half a century has passed since Stephen’s student days here. Today’s Brown is more broadly engaged with the global community than ever — not only in the excellent work of the Watson Institute for International Studies, but in international collaborations across all the academic disciplines: In art and architecture, history, literature, global health, mathematics, physics, and engineering. Brown’s planetary geologists are involved in the exploration of the solar system with colleagues in Europe, India, Russia and other nations. The Brown campus is home to more than 1,600 international students, scholars and their families, representing more than 90 countries. And on average, at any given moment, more than 300 Brown students and faculty are teaching, learning, or conducting research abroad on nearly every continent. Deepening Brown’s engagement and service on a global level is an essential element of Building on Distinction, our plan for the future. Sadly, Stephen Ogden did not live to realise his dream of advancing world peace and understanding among the nations of the world. He died in 1963 from injuries he had suffered in an auto accident during his junior year at Brown. Two years later, the Ogden family created this lectureship as a tribute to Stephen’s aspirations. Across almost five decades, the Ogden Lectures have brought nearly 100 of the world’s most prominent international thinkers and agents of progress, including heads of state, prime ministers, diplomats, historians, and journalists to Providence for presentations such as the one we are about to have this afternoon. On behalf of the University and the Providence community, I thank the Ogden family for establishing this important and productive part of Brown’s international reach. And I invite you to join me in recognising Susan Adler Kaplan and Dr Robert Ackerman, who are here today representing Stephen’s family and friends, including his sister Peg Ogden. In the 18 years since, His Highness’s critically important work has intensified and expanded. As the 49th hereditary Imam — the spiritual leader — of the Shia Ismaili Muslims, His Highness has been productively engaged with the development of Asia and Africa, work he and his organisations have pursued for nearly 60 years. He is the founder and chairman of the Aga Khan Development Network, one of the world’s largest private development agencies, which has improved living conditions and opportunities for people in 30 countries through work in healthcare, education, architecture, rural development, the built environment, and the promotion of private-sector enterprise. As an indicator of the scope of Aga Khan Development Network, consider that it encompasses more than 400 healthcare facilities and more than 200 schools. Its annual budget for non-profit development activities is approximately $600 million. In 2012, project companies associated with those efforts generated close to $3 billion in total revenue — surpluses of which are reinvested in further development activities. The Aga Khan Development Network enjoys close partnerships with public and private institutions, including governments, international organisations, companies, foundations, and universities. About 80,000 people work for the Network. Whether for 250 years or a thousand, we at Brown recognise and celebrate the institutions and people throughout the world who champion fundamental values like the discovery of knowledge and the notion that knowledge is a globally shared source of strength. Ladies and gentlemen, please join me in welcoming His Highness the Aga Khan.